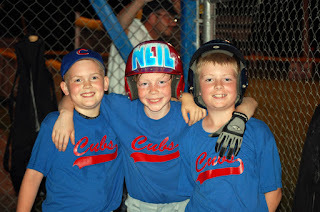 Baseball Love - Nekaro & Co.
Last night was the last game of the regular baseball season. I'm kind of bummed out. When it was time to sign up in the Spring, Neil-age didn't want to play. The coach that he'd had for the past 2 years wasn't going to coach so he was worried about playing for someone new. We made him play anyway. I knew once he started playing he would be glad that he did. I was right. Duh! !